The Soetes and Soup Festival will kick off this year on Friday, 20th of July and run till Saterday, 21st of July 2018. We are excited to announce that we will have two artists performing on Friday night, the 20th of July. Emile Swiegers, is the son of the beloved singer and song writer - André Swiegers. He grew up in a musical home, his dad being an songwriter and drummer brother. “Evoking the magic of an infinitely rich musical history within a modern-day context, Emile seamlessly incorporates elements of rhythm & blues, soul and finger style guitar in his work”. 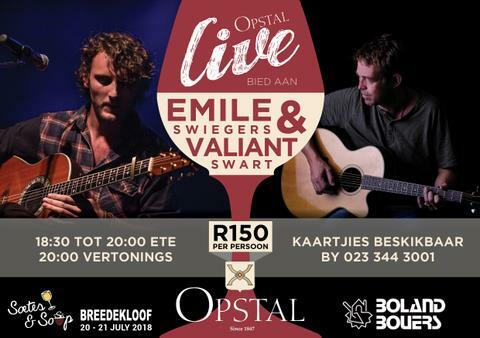 Valiant Swart is an well known South African musician and enchants his audience with Afrikaans folk rock music. For more information on the Soetes and Soup 2018 Festival and ticket sales please contact Breedekloof Wine and Tourism on (023) 349 1791.